This produce tag isn’t a joke from the guy at Kowalski’s. 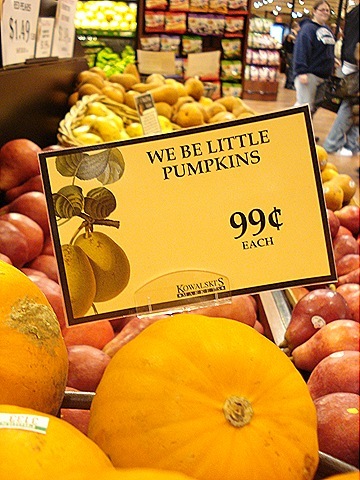 It’s a real name for a miniature pumpkin. Here’s a few more terribly precious names for mini pumpkins: the Baby Boo, Jack Be Little, Lil’ Goblin, Munchkin, and Sugar Pumpkin. We be little, we be ready for you. Fall is finally here! This entry was posted in Around Town on September 30, 2008 by Carrie. Since I’m a book editor by day (and often by night), I spent Saturday afternoon at the Midwest Booksellers Association conference at the Excel Center. I live a couple blocks away, so I grabbed a morning coffee and wandered over there on foot. I was surprised at how quiet it was, but maybe that’s more a factor of the Excel and St. Paul itself. The halls were bare, and even the Headwaters cafe that might serve up a cup of coffee to these folks was closed. What kind of an image does that portray to visitors? Hmph. Even more surprising, though, was the surfeit of free books everyone was carrying around in their overstuffed tote bags. Do regional trade shows open up their book vault more generously than BEA? Even though I didn’t intend to, I ended up with an impressive collection. Here’s my favorites. These books are all so beautiful and touchable I don’t know where to start. Reardon’s book is a classy square shape with elegant internal design. Learch’s looks like a fun, quick read and I’ve heard quite a bit about this local writer in the past few weeks. This’s (pronounced teess) looks so damn clever and full of smart lessons in food. And Jamie’s, well, just look at this beauty of a book and tell me you wouldn’t commit yourself to a lifetime of cooking on the spot. It pleads to you “Will you please come cook with me?” Yes, Jamie. I will. After all this hard work, it only made sense to take myself out to lunch, so I headed over to Mickey’s, the famed art deco dining car. 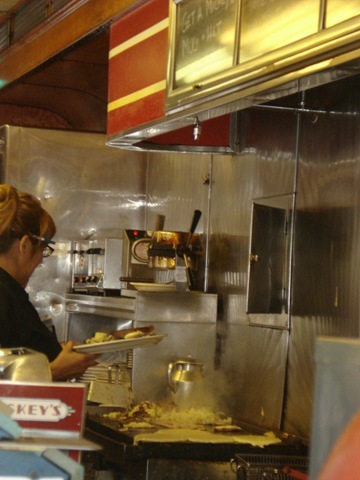 The place was packed to every wall with families, hipsters, and old folks, all fed by one woman effortlessly working the grill, pouring out puddles of pancake dough and omelets and browning a snowbank of potatoes. It took awhile to get all the orders out, but it was easy to bide my time in such a lively place. The young server/bus boy filled my Diet Coke at the first sign of an empty glass, and the waitress was perfectly rude and friendly to everyone she talked to. You could take lessons in life from this place. The BLT finally arrived looking like an ideal model of itself. The fries were fresh, crispy, and worth every calorie, and the BLT was exactly what you’d expect. That must be the goal of every great diner, to serve the canon of quintessential food with no surprises and no disappointments. 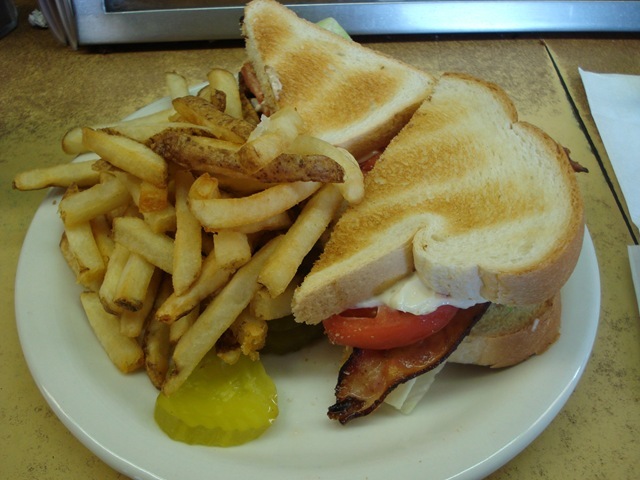 The economy has tanked, global pressures are high, and the presidential election has become more than a little absurd, but a BLT will always be a BLT, and the Heinz ketchup at a diner always flows more smoothly than it does at home. At least there’s a few things in life we can rely on. This entry was posted in Around Town, St Paul Restaurant Reviews on September 28, 2008 by Carrie. How often does a sassy caterer throw a fabulous party to mark the grand opening of their brand-new, custom-made facility while serving a bunch of killer food for FREE for four hours on a Thursday night? It’s a rare opportunity if I ever heard one! 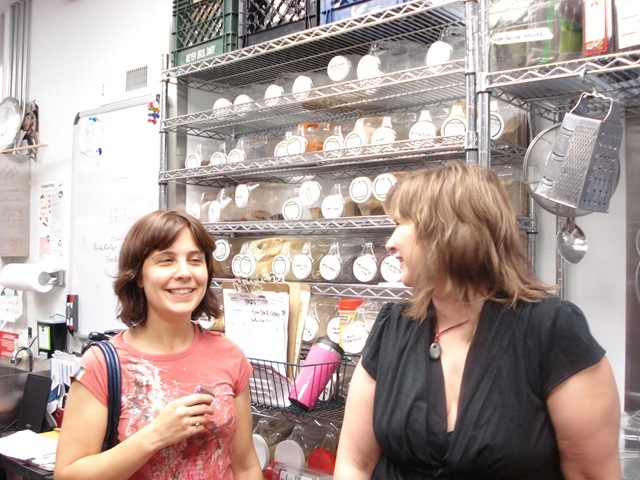 Heidi and Amy are the owners of Chowgirls. Tonight, they celebrated their move to Northeast by throwing this classy little fete. I went with my partner in crime Angela, and we certainly got the inspiration we were hoping to find. First of all, in the adjacent art gallery was a scene too good to be true. A riot of delicious, easy-to-eat party food: marinated chevre; spanikopita; pastries filled with chicken and apricot; little toasts with marcona almonds, honey, and cheese; a spicy/creamy vegetable soup of some kind; small sandwiches; mushroom and lamb whatnot to dollop on bread; blood-red cupcakes . . . Gads, the list goes on, and I didn’t even make it over to the table full of wine, as content as I was with the spoils at hand. We then headed over to their space where Heidi generously shared her time by giving us a tour of the kitchen and answering all of our questions about her business, which seems to have gracefully filled a culinary hole in the Twin Cities. 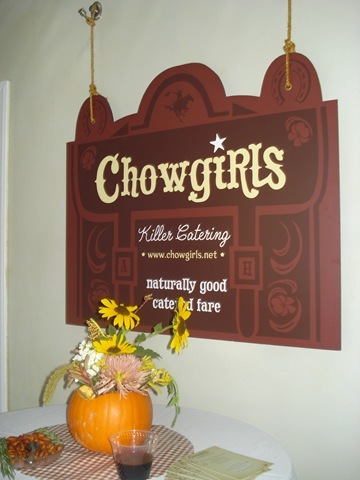 After four years of business, the Chowgirls have 20 employees and a seriously inspiring kitchen that is a perfect example of what I love most about food: self-expression. The floor tile and etched glass featuring their logo were made locally by friends. 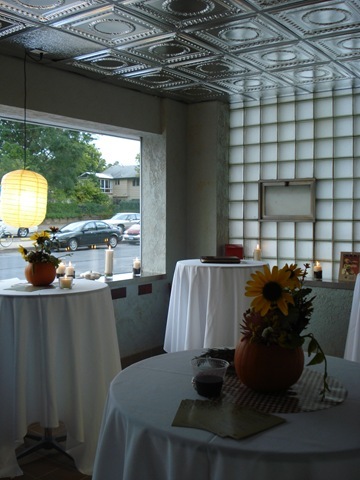 The tin ceiling makes for a classy entrance. 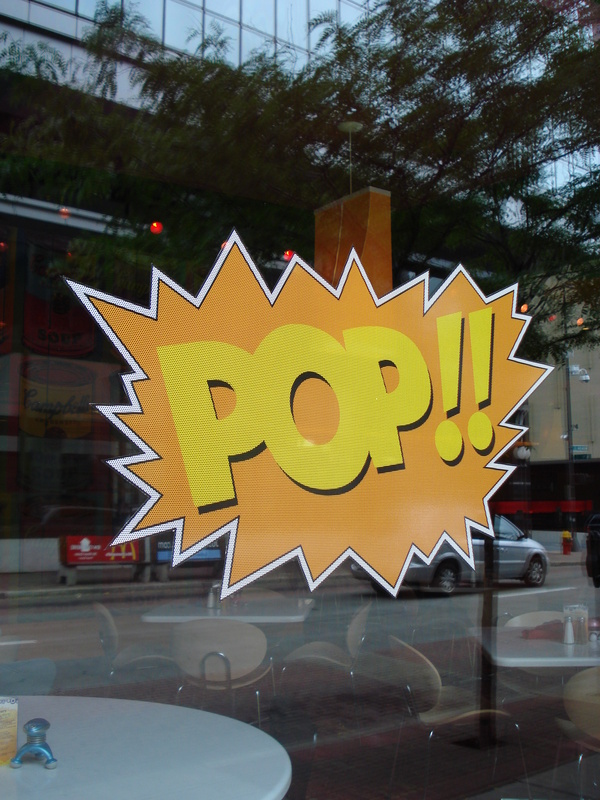 The fun graphic design lets visitors know they’re in for something special. And the bright, efficient kitchen obviously churns out all that remarkable food. Way to go, Chowgirls. I hope your new digs give you all the additional success you clearly deserve! This entry was posted in Around Town, Gal pals on September 26, 2008 by Carrie.